COVER REVEAL & SNIPPET: In LOVE with this cover. Here it is! 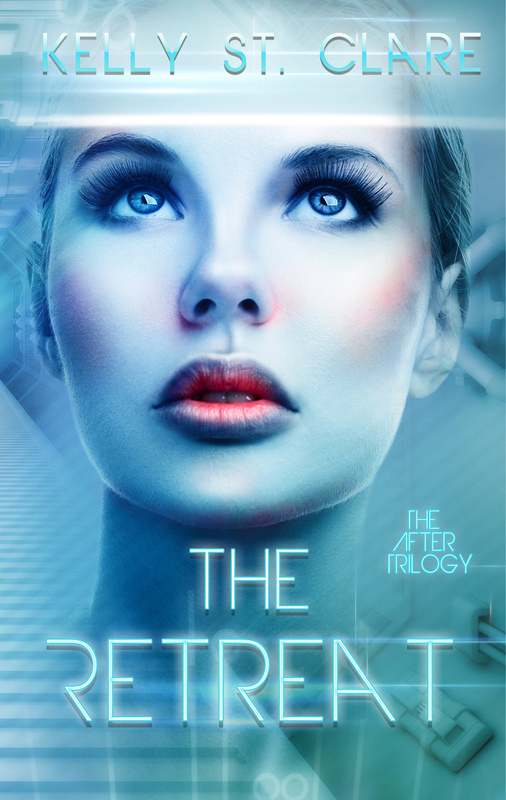 The cover for my new science fiction dystopian series. The Retreat releases August 30th 2016. I’d like to thank Tracey from Soxsational Cover Art for the beautiful job she’s done! Read on for a sneak peek into the story. It introduces you to our main character, Romy (don’t call her Rosemary, she doesn’t like it) and the four other members of Knot 27; Elara the lazy, Thrym the serious, and the ‘twins’ Phobos and Deimos. They’re always up to no good. 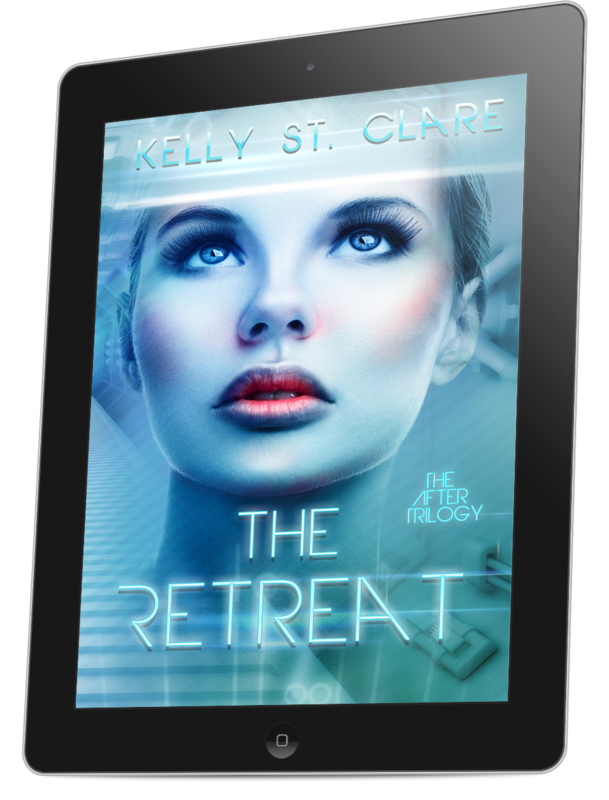 Snippet #2, The Retreat – Copyright Kelly St. Clare 2016. Romy looked up from her nano to meet the ever-cheerful face of Thrym, one of her knot mates. His finger was pointing, a bit unnecessarily, out the window, at outer space. Unobtainable Earth was a bright beacon of blues and greens in the distance. That wasn’t what Thrym was talking about, however. He was referring to the debris littering the area where their space station coasted in Earth’s orbit. “Really. Again? We were on it two days ago.” Elara threw herself back onto the narrow white bunk, one of five beds in the bare white unit. Five bunks for the five members of their team. Romy knew about the small skirmish with the Critamal that Thrym spoke of. Unfortunately, it only took one exploding spacecraft to provide Knot 27 with days of clean-up. And because all space stations sat right where the debris liked to gather, four hundred kilometres above Earth’s sea level, Thrym was right: it was clean or collide. Elara sat up, slouching dramatically. Her brown hair was short and choppy, and a few adorable freckles dotted her nose. Soft hazel eyes blazed from her delicately featured face. “I know, but can’t someone else do it?” She snapped . . . the delicate part was misleading. The pixie-like girl was the laziest person Romy knew. Elara must be what humans were like 150 years ago. Ironic, considering the space-soldier’s genetic engineering was supposed to eliminate faults such as fear, idleness, and curiosity. Somehow the scientists must have screwed it up in Elara’s case because she possessed laziness in copious amounts. Thrym glanced Romy’s way, his blue eyes dancing from beneath his professional mask. If Romy didn’t know to look, his amusement would’ve passed unseen. “ETA is thirty-four minutes. We need to move,” he said. “I’ll alert Deimos and Phobos,” Romy replied. She lifted her wristwatch and pushed the square button on the side three times. Scrolling through the locations stored on the device, Romy selected “Earth Dock” to send an urgent alert to the entire team to gather there. Elara and Thrym silenced their own beeping devices without looking. Wordlessly, the three began preparations. Romy tied back her chin-length white-blonde hair as best as she could—though it was almost certain the fine strands would escape within minutes. She reached for her spandex suit next. Each space soldier was trained to get the orange spandex ventilation garments on in sixty-five seconds. Elara took three minutes on average. According to Deimos, her fastest time was 153 seconds. The entrance to their tight quarters swept upwards at their approach and the trio began to move at a fast clip down the clinical white, pressurised hallways of their home: Orbito One. There were eight orbitos in total. Each identical. Each containing five hundred active life forms. And each equipped for efficient space survival. Clothing came vacuumed-sealed, the food dehydrated. You remained clean. You remained healthy. You did not waste resources. Each orbito was a flawless operation at all times. It was how things had to be. Orbito One was the first of its kind, built onto the historical International Space Station left over from pre-global warming. The ISS was the oldest reminder of what life had been in the past. Romy believed it was this relic—her closest link to the ground—that triggered her passion for Earth’s history. Sparked the uncontrollable urge to learn all she could about their lost home. Romy, daydreaming just for a change, walked into Thrym, who’d stopped in front of her. “Sorry,” she mouthed, earning a fleeting wink from the man and even a rare smile, which showed bright white against his black skin. With Thrym, you usually had to watch his blue eyes for information. He didn’t show much. Perhaps it was due to being the most serious and focused of their group. Romy smiled; she could always rely on Thrym to have his dark hair shaved to regulation and his possessions neatly stored in his small personal compartments. “Knot 27, reporting for Debris,” Elara stated as a red light scanned the trio. “Wait!” A thin shout echoed behind them. Romy grinned as Deimos and Phobos hurtled into sight. Running was strictly prohibited, everywhere, at all times—not that it ever stopped the twins. They didn’t really look alike, aside from their startling green eyes, but everyone called them “the twins” because the pair was rarely apart. Their wavy, shoulder-length hair reminded Romy of pictures of the surfers she’d read about, from a time when humans would stand up on streamlined boards in the ocean for fun. Needless to say, the length of Deimos’s black hair and Phobos’s dark blond hair was in violation of the chin-length maximum—another rule they somehow evaded. All space soldiers were attractive, a vanity of the Orbitos’ creators, but the twins were drop-dead gorgeous. No doubt, this helped the pair escape punishment time and again. Romy could attest to their effect, having been on the receiving end of their innocent green gaze on several occasions. Their entire knot was scanned anew in front of the Earth Dock entrance. A clinical voice replied, “Authorised.” The voice sounded like that no matter who replied from the control deck. Romy’s four knot mates were the closest thing to a family she’d ever had—or would have in this life cycle. The term “knot” described the jumble of tubes and cables of five human-sized tanks clustered together. It was how each of their force was made. She wondered if she’d been part of the same knot before, in another cycle. Their bond sure felt that way. But Romy knew the geneticists liked to try different personality combinations in order to find the ‘ultimate team’. She hoped Knot 27 would stay together until the return to Earth—though the wish was neither likely, nor in her control. Once harvested from the tanks at age twelve—which ensured mental and physical maturity—a knot trained together in space warfare as cadets, and then worked together until they were recycled at age thirty-five. Life in space was hard and it was thought that beyond thirty-five, the reflexes slowed and deteriorating general health impacted performance. This was the cycle of a genetically enhanced space soldier. You were killed, or recycled, but the number of active soldiers always remained constant; the total of 4000 constantly replenished from the hundreds of cadets cooking in the tanks. Read Snippet #1 of The Retreat here.